If you're finding your new Mighty Mouse or MacBook Touchpad not particularly flexible or lacking essential features, then BetterTouchTool adds many new, customizable gestures to them. BetterTouchTool allows you to customize many different types of gestures. 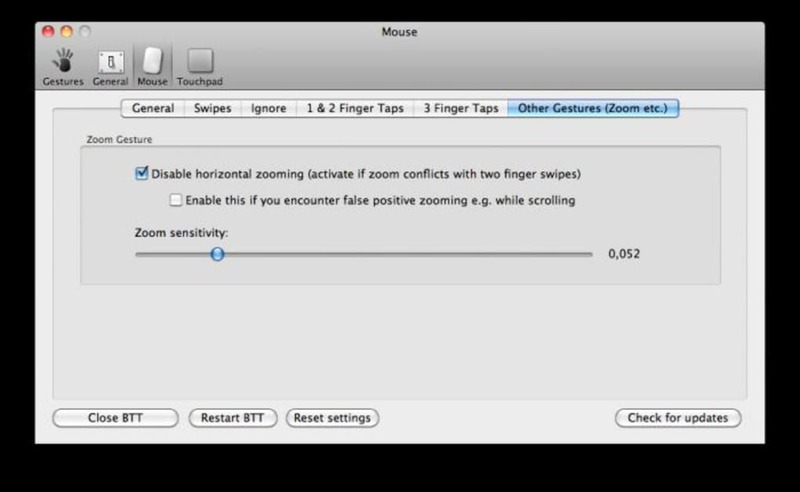 On the Magic Mouse, these include pinch in/out (zoom), single finger tap left, single finger tap right, single finger tap, two finger tap, two finger click, two finger swipe (up/down/left/right), three finger tap, three finger click, three finger swipe (up/down/left/right) and 'TipTap' left/right. On a Touchpad, it allows you to configure three finger swipes (up/down/left/right), three finger tap, four finger swipes (up/down/left/right), four finger taps and 'TipTap'. There is very little to fault with BetterTouchTool. 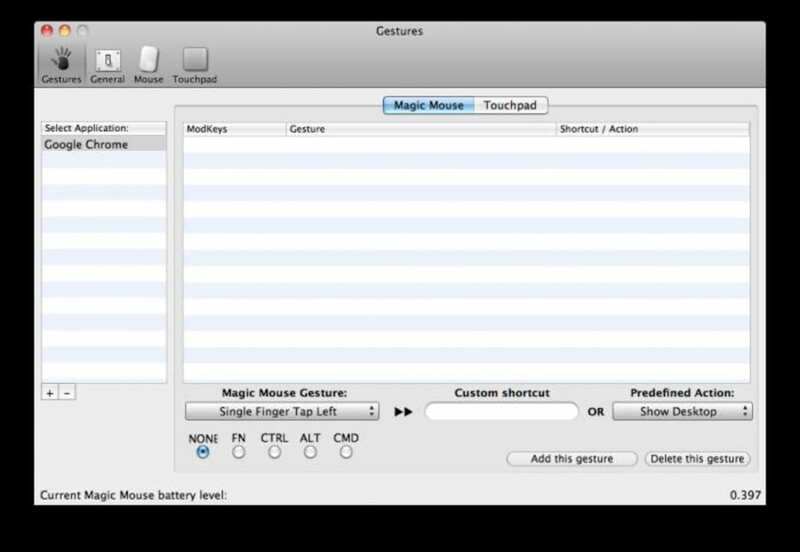 It really brings your Magic Mouse or Touchpad to life and enables you to make significant savings in productivity in the way you use your mouse device. It's easy to use, highly customizable and best of all, completely free. If you've never used BetterTouchTool, then your simply not getting the best out of your MagicMouse or Touchpad. Great, but stop with the almost daily updates.. I like it very much... but the nearly-daily updates are getting to be a bit much. How about once a week, or maybe even every month? I shouldn't have to update software all the time like this! OTHER than that, great tool, and I love it. Everyone with Snow Leopard should have this. Great flexibility, versatility, and ease-of-use. It's a great utility, but.... ... when I had BTT running last time, I began to have my window scrollbars move without touching. Mostly, the window jumps up or down only a little, but it's tough when I'm writing in Word.